The Irish have had a love affair with skiing in the Austrian Alps for years. But what about summertime? 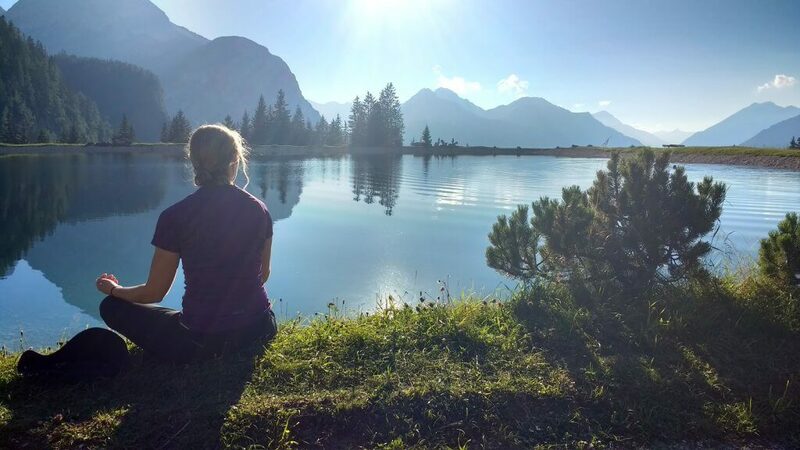 Roisin Finlay visits the Tirol on the Outsider hiking trip and, plain and simple, falls head over heels with this little piece of mountainy heaven. I am stock-still. I can hear the sound of the rescue helicopter nearby, its blades whipping up an intense thrumming beat, but the tall shady pine trees all around me mean I can’t see it. I still don’t move an inch and I wonder how long I’ve been like this. My eyes are transfixed on a small bee-like hoverfly, which seems to levitate in a dust-mote filled beam of light streaming through the dark green. The creature’s wings are moving so fast they are completely blurred, almost invisible. It darts to a lush purple Alpine flower, lured by its nectar, and then shoots back to its hovering position. “Hey, come and check out the helicopter,” a cheery voice booms down the trail. The hoverfly darts away and my dreamlike trance is broken. I move to rejoin my hiking companions. While I’ve been having my mind blown by nature, they have all been eyeing up the amazing man-made flying machine which now heads off into the mountains. It turns out it’s not a rescue craft at all but instead is delivering supplies to one of the mountain huts. “Maybe it’s headed to the one where we’ll have lunch today,” muses another fellow hiker, which makes us all smile. 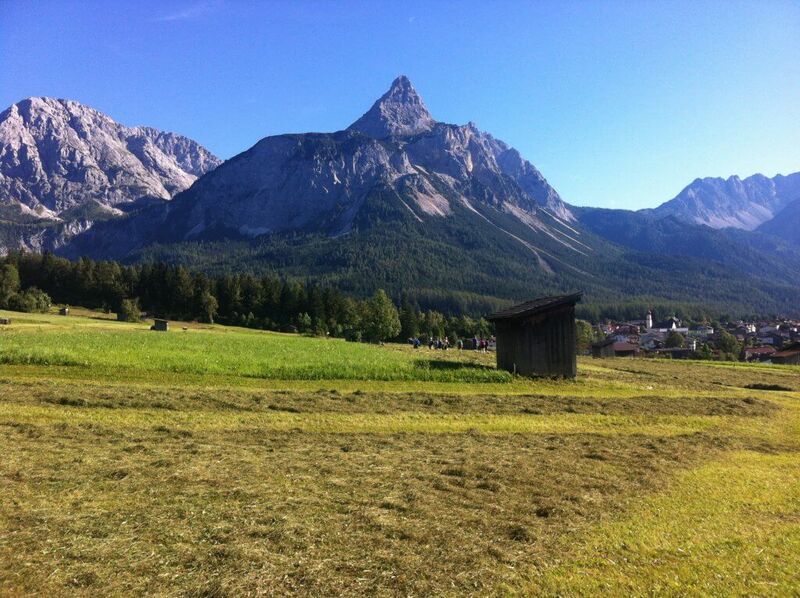 We are on a weeklong trip to Ehrwald in the Tirol region of the Austrian Alps. The area, which is just on the border with Germany, is chocolate-box-pretty. The towns still boast many old wooden chalet-style buildings above huge barns for animals and feed and every home has a work-of-art woodpile stacked and ready for winter. Surrounding each village or town, ‘alms’ or meadows spread out and climb to the pine forests on the lower slopes of the mountains with the high peaks towering above. There are 22 of us in our group and it’s a lovely motley mix that ranges in age from 30 up to late 60s – with just about every age in between. There are couples that have been together for years and those who’ve recently met, a family group made up of mum, dad, their daughter and her husband, friends, a duo of sisters, and those who have travelled solo for the trip like me. But before long, and in no small part thanks to the warm atmosphere created by hosts Daniela and Mido at the family-run Sonnenburg hotel where we are the only group staying, we are settling into easy companionship, chatting away during hikes, eating dinners and having drinks together. Daniela, Mido and Topflight, a company that you may associate with ski holidays but that also organises specialist group hiking trips, have seen to it that there is little for us to concern ourselves with other than putting one foot in front of the other and having a good time. Nothing it seems is too much trouble for them. All we have to do each morning is pull on our boots and gear, eat a hearty breakfast and be ready to meet our local guides – Reini, Peter and Ingrid. Even motivation is taken care of. Pulling back the curtains to reveal a picture of steely grey peaks rise up from the forest into a deep blue cloudless sky will nudge anybody out of bed, even when backs and legs groan with tiredness from previous long hikes. And so we settle into a routine where our group splits in two each morning, depending on whether we want to push ourselves on the A hike (hard) or take it a bit easier on the B bike (medium). Reini, Peter and Ingrid, know these mountains like their families and are subtle experts when it comes to deciding how far to push a group so that they get the absolute best out of their holiday. Each day is magnificent. We walk between 10km and 20km per day, which is anywhere five hours and nine hours. The hikes range in difficulty – from long, hot and high treks through Alpine glacial scree fields, to meandering shady trails through green forests and alms (meadows). The chat is easy and the group gets to know each other as we hike together, sharing snacks and stories. We walk parts of two sections of the Eagle Walk. It’s a 413km hut-to-hut trail through Austria that is broken up into 33 stages. As we explore one of the sections that trace the border between Austria and Germany, Reini tells us that over the years it was used as a smuggling trail from ancient times right up to the 70s when hearty fit Austrians would carry televisions back along it from cheaper Germany. We ogle an array of stunning wildflowers and watch birds of prey wheel on thermals overhead. Reini also shows us teeny wild strawberries and we marvel at these vivid red miniatures. We taste tiny and perfectly formed wild blueberries. We spot anthills where we are shown how the ants emit formic acid. We sniff it and it hits us like vinegar from a freshly opened bag of chipper chips. 6 great reasons you need to go on a hut-to-hut hiking trip in the Dolomites! Another day, we take the precipitous nerve-jangling cable car up to the Zugspitze which is Germany’s highest peak. There we walk on the snow of the glacier and gasp at the views of the mountain ranges spreading out in the distance. In 1854, the mountain was given to Bavaria as a present by Emperor of Austria Franz Joseph I as a wedding present to his wife Princess Elisabeth or Sissi so that Germany could have a really high mountain too! And one night we eat a hearty dinner in a mountain hut and hike down afterwards carrying flaming torches to light our way. I am intoxicated by the dewy smell of the cut hay in the fields and the bright spray of the starts of the Milkyway overhead. But my favourite hike of all is the circuitous one we take to see Lake Seebensee. It is also by far the hardest day as temperatures soar to 30°C, without a puff of wind. Along the way, as we stop to catch our breath, Reini distracts us by showing us wreckage from an American plane that crashed here during WWII. A survivor married a local farmer’s daughter and her wedding dress was made from the parachute silk. On we trudge up, up, up, along a dusty trail through a steep scree field. Several of us drain the dregs of our water supplies as we shuffle on in the heat, sunscreen sweating off our faces. Finally, we crest the hill to a perfect scene. Against a sky of deep blue, cathedral-like mountains with ridged grey cliffs dropped into a rich green, fairy tale-like valley. The intermittent dingle of distant bells drifts to us on a gentle breeze as scattered goats and sheep graze below. 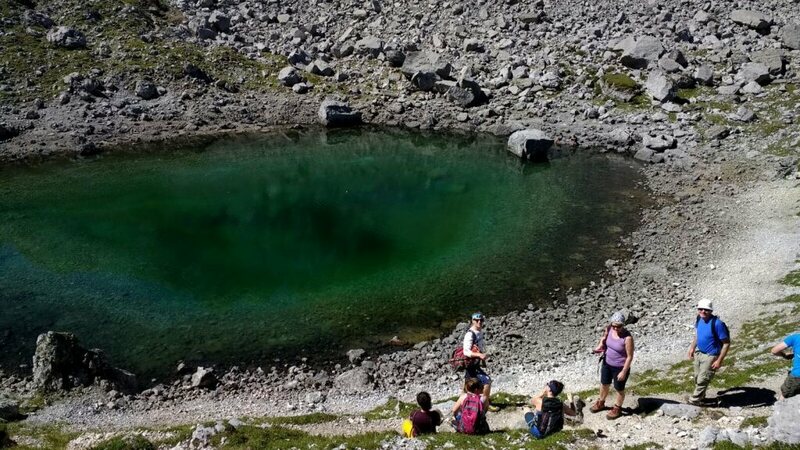 A turquoise lake, the Drachensee, twinkles in the valley, begging us to take off our socks and soothe our feet. Or shed all of our clothes and submerge ourselves in its cool water. A warm wooden Alpine hut perched nearby promises ice-cold drinks and food. We hear marmots whistling to one another and on closer inspection see several of the furry creatures, scampering around on the hillside. Every day we have eaten delicious lunches on the wooden terraces of such mountain huts and have become experts on everything from Würst (sausage) to Apfelstrudel (the best apple tart known to man) and Kaiserschmarrn (caramelized pancake made with rum-soaked raisins, eggs, flour, sugar, and butter) but today’s meal of freshly fried Tiroler Gröstl (a bacon, onion and potato fry-up) washed down by ice cold beer in the Coburger hut mountain hut is like no other. After lunch, with thoughts of a swim on our minds, we head of towards Lake Seebensee. It’s stunning with water of the deepest turquoise. Apparently, the colour is due to minerals from the limestone mountains. We are all ready to dive in but as it’s getting late and the water temperature is only about 12°C, we are persuaded onwards to the Ehrwalder Almsee lake. Our dip in this reservoir is perhaps the most perfect of my life. My heart literally feels too big for my chest. Like pure joy is trying to burst out. Tears even threatened. I feel euphoric. In spite of all the effort. Or perhaps because of it. Slipping into the soft water washes away dust and grime mixed with sunscreen and eases sore tired muscles. But it also seems to wash away life’s cares. Like some sort of heavenly infinity pool, the waters shimmer under the dropping sun and reflect the mountainous backdrop in a shimmering haze. The soundtrack is provided by cicadas in the surrounding forest, their music moving in waves through the trees. We are physically tired and weary that night like every other. We sit on the terrace outside the hotel, sipping cold Cokes and beers, and watching the sunset turn the grey mountains pink. Everyone is reluctant to go indoors but eventually, our stomachs move us as yet another delicious meal beckons courtesy of Mido’s cooking. We swear we’ll go to bed early but inevitably wind up in the bar having a few drinks and singing songs. I’m struck by the lovely vibe that has developed amongst our motley gang with our varied ages and backgrounds. It seems like our lives at home have been paused as we unwind and bond through a common love of hiking. Finally, in the wee hours, I drag myself off to my room. But before I finally get my weary but happy body into bed I go out onto the balcony and deeply inhale the fresh dewy air and stare at the enormous starry sky, the silhouette of the quiet mountains against the night sky. 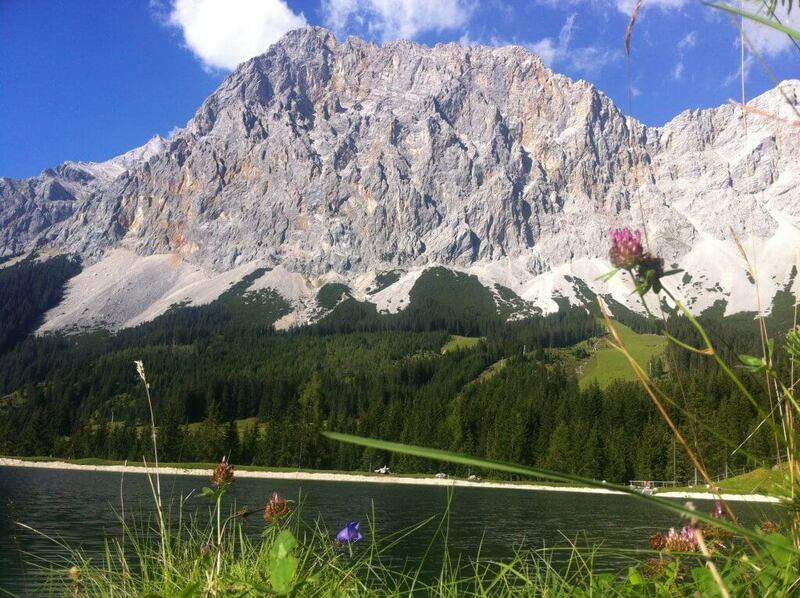 I am utterly seduced by the Austrian Alps and this perfect holiday. My mind feels slow and calm. Slow enough to see the incredible beauty of the tiniest of Mother Nature’s creatures like a hoverfly or a tiny wild strawberry set against the mind-boggling beauty of a towering range of mountains. The first Outsider hiking trip was such a success that we will return to Ehrwald with a group again from 24 August 2019. We’d love YOU to join us! 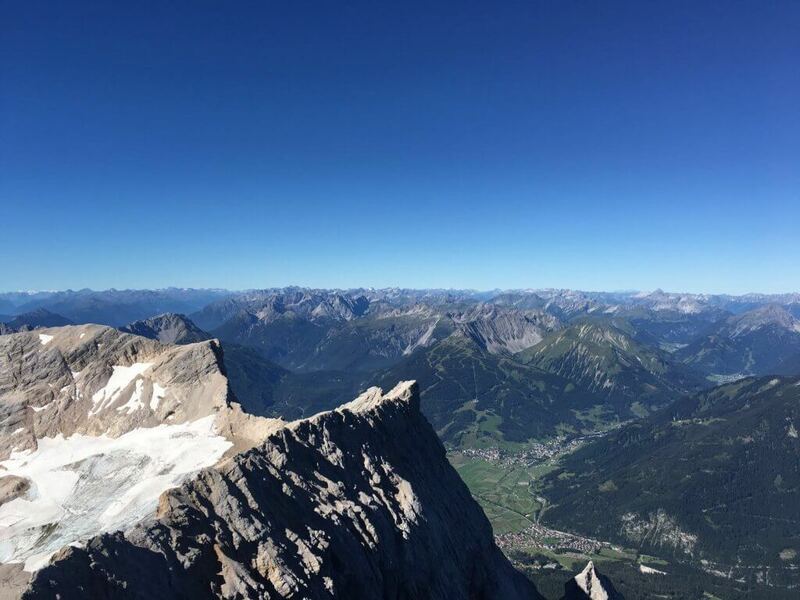 Like all the previous trips, there will be guided hikes as well as dips in the mountain lakes, hearty meals in mountain huts and a trip to the Zugspitze, Germany’s highest point. If that’s not enough for you, you can get your kicks by trying Via Ferrata or climbing/abseiling/flying fox or mountain biking (optional extras). Accommodation (dinner, B&B) is in the cosy Sonnenburg Hotel where your exceptional hosts Daniela and Mido will look after you in style. And all for the bargain price of €799 including flights, transfers and a whole lot more! 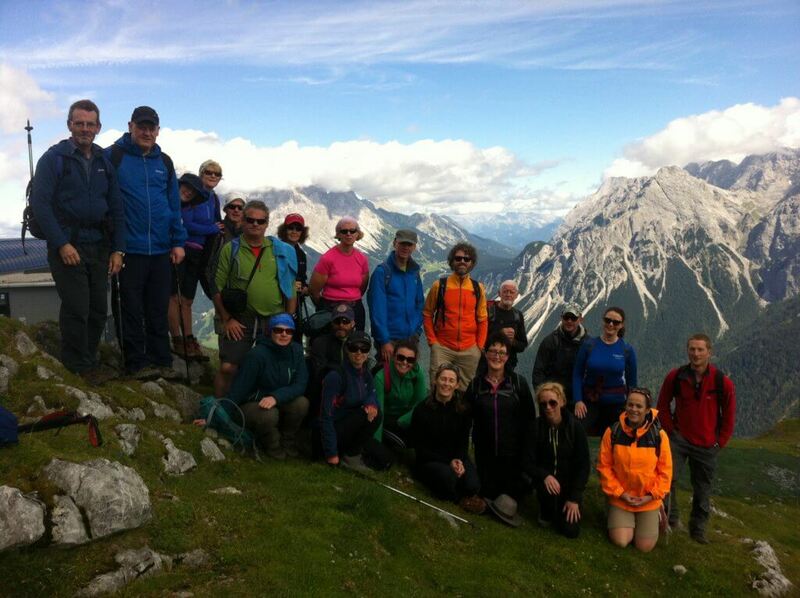 If you can’t make the Outsider trip but would still like to hike in Ehrwald, contact Topflight to find out about the six weeks dedicated to individuals and small groups who would like to explore the area by foot. Or if you would like to organise your own group trip and have exclusive use of the Sonnenburg Hotel, Topflight has about six weeks set aside for walking groups/clubs. There are also three weeks (early July, last week of July and first week of August) set aside at the hotel for family adventure groups.